The Chino mine, an open-pit porphyry copper mine, is 15 miles east of Silver City near the village of Hanover in southwestern New Mexico (Figure 1). An overlook of the pit, complete with educational displays, is located on the south side of New Mexico Highway 152 east of Hanover (Figure 2). The excavation is also known as the Santa Rita Mine or Santa Rita del Cobre, named for the former village of Santa Rita, which was removed in the 1950s as mining operations in the area expanded. Concern has been expressed about the stability of the famed landmark on the southeast side of the mine, the spire known as the Kneeling Nun, as the modern-day mining operation moves to the southeast. The Chino mine is the largest porphyry copper deposit in New Mexico. The pit is currently ~1.75 miles across and 1,350 feet deep. The Apaches were the first to notice native copper lying on the ground in a valley northwest of Santa Rita Mountain. The open-pit mining operation began in 1910. The mine became part of Freeport-McMoRan in 2007. Figure 1 – Index map showing the geography of southwestern New Mexico and the location of the Chino Mine. Figure 2 – View of the Chino Mine from the overlook on NM-152. Kneeling Nun Tuff forms the prominent reddish-brown cliff on the skyline. The Kneeling Nun landmark located at the base of the cliff is hard to see from this vantage point. Figure 3 – Location of porphyry copper deposits in the southwestern United States (modified from Titley and Anthony, 1989). The Chino mine is in the Basin and Range province along the southern margin of the Mogollon-Datil volcanic field. The Mogollon-Datil volcanic field straddles the transitional boundary between the tectonically stable Colorado Plateau to the north and the extensional terrane of the Basin and Range to the south (Figure 3). 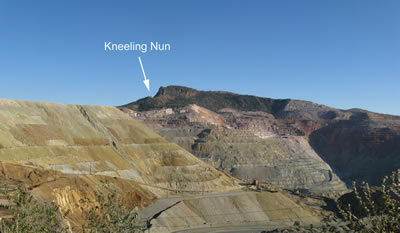 The Kneeling Nun spire above the mine is a landslide block of tuff at the base of cliffs of 34.9 million-year-old Kneeling Nun Tuff, which had its source in the Emory caldera in the Mogollon-Datil volcanic field to the north. The mine is in a northwest-trending fault block known locally as the Santa Rita Range or the Cobre (Copper) Mountains. The northwest-trending structural grain in southwestern New Mexico is primarily the result of Jurassic rifting and subsequent Laramide compressional deformation. The mineralization is in and around the Santa Rita stock, a 58 million-year-old granodiorite pluton that is just one of many intrusions emplaced across southern Arizona and southwestern New Mexico during Laramide deformation 80 to 40 million years ago (Figure 3). Figure 4 – View of the Cobre Mountains looking from San Lorenzo toward the west. The dark bed low on the escarpment is the Cambrian Bliss Formation. Proterozoic rocks (pC) lie below the dark band. The light gray cliff on the skyline is the Silurian Fusselman Dolomite. The Ordovician El Paso Formation and Montoya Formation form the slopes below the Fusselman. The Cobre Mountains are composed of Proterozoic metamorphic and igneous rocks covered by about 3800 to 4800 feet of Paleozoic to Mesozoic sedimentary rocks. Cretaceous diorite to quartz diorite sills subsequently intruded these older rocks. Shortly thereafter, mafic to intermediate composition dikes and other intrusive bodies were emplaced and 2000 feet of intermediate composition lavas and breccias were erupted onto the surface. Next, the large granodioritic plutons at Chino and at Hanover-Fierro to the north were intruded. The last stage of intrusive activity in this area was the emplacement of rhyolitic dikes. The multiple intrusions locally domed and folded the older Paleozoic and Cretaceous strata. The mineralization at Chino is associated with the Cretaceous to Paleogene intrusive activity, particularly with the large granodiorite stocks. The copper minerals were concentrated near the tops of the stocks during subsequent erosion of the area (see mineralization section below). Later, tuffs and lava flows erupted from the Mogollon-Datil volcanic field to the north covered the older erosion surface and the mineral deposits. Uplift of the mountain range during Basin and Range extension renewed erosion of the area, creating the landscape that we see today. Figure 5 – Stratigraphic column of rocks deposited in the Cobre Mountains (after Jones et al., 1967). The Proterozoic rocks and Cambrian-to-Cretaceous strata that form the Cobre Mountains can be viewed along Highway 152 to the east of the Chino mine (Figures 1 and 5). Mack (1997) and Mack et al. (2008) describe the outcrops along the highway in detail. The oldest rocks, which are exposed in the pronounced escarpment to the west of the village of San Lorenzo (Figures 1 and 4), are greenish-black Proterozoic basaltic rocks that have been mildly metamorphosed. Elsewhere, closer to the Chino Mine, Proterozoic rocks are gneiss and granite (Jones et al., 1967). The exact age of the Proterozoic rocks in the Cobre Mountains has yet to be determined; in the Burro Mountains to the southwest of the Chino Mine (Figure 1), Proterozoic metamorphic rocks are 1.6-1.7 billion years old, granite is 1.46 billion years old, and mafic dikes are 1.1 billion year old (Amato et al., 2008 a,b). The Cambrian Bliss Formation, a brown dolomite and limestone interbedded with crossbedded sandstone deposited along the shore of a shallow tropical ocean, rests on the Proterozoic rocks. At least 550 million years of Earth’s history is missing from the rock record across the Great Unconformity in this area. The Bliss Formation contains a few beds that have a distinctive green color caused by the presence of glauconite, a clay mineral that precipitates in shallow marine environments. Early Paleozoic carbonate deposits form the remainder of the prominent eastern escarpment of the Cobre Mountains west of San Lorenzo. The Ordovician El Paso Formation gradationally overlies the Bliss Formation. The base of the overlying Ordovician Montoya Formation is marked by a thin sandstone or sandy dolomite interval. The Silurian Fusselman Dolomite forms the light-gray cliff on the skyline of the escarpment (Figure 4). The limestone and dolomite in the El Paso, Montoya, and Fusselman formations were deposited in a warm, shallow ocean. The younger rocks in the Paleozoic succession are exposed along the highway where it flattens out on top of the escarpment as one drives west from San Lorenzo. The Devonian Percha Formation, characterized by black shale intercalated with thin discontinuous beds and nodules of gray limestone, was deposited in seawater that contained little oxygen. The Mississippian Lake Valley Limestone, a light-gray limestone with a few shale beds, gradationally overlies the Percha Shale. The Lake Valley Limestone is quite fossiliferous and contains the remains of bryozoans, crinoids, and brachiopods, indicating that the amount of oxygen in the shallow marine waters returned to life-supporting levels. The topmost of the four members of the Lake Valley Limestone, the Tierra Blanca Member, is known locally as the crinoidal limestone member. Most of the sphalerite-galena and magnetite-chalcopyrite ores in the Santa Rita area are concentrated in the Tierra Blanca Member of the Lake Valley Limestone (Jones et al. 1967). A significant time gap is associated with the conformable contact between the Mississippian Lake Valley Limestone and the Pennsylvanian Oswaldo Formation. The Oswaldo Formation is a cherty limestone with a few beds of shale and sandstone. This unit grades up into the Pennsylvanian Syrena Formation, a shaly limestone and limy shale. The Pennsylvanian units were deposited in shallow seas on a southward-deepening continental shelf (Kues and Giles, 2004). The Permian Abo Formation, composed of red shale, siltstone, and limestone with lenses of limestone conglomerate, unconformably overlies the marine Pennsylvanian rocks. Figure 6 – Map showing the distribution of Upper Jurassic to Early Cretaceous Bisbee Basin rift basin deposits and structures (modified from Lawton, 2000). Cross-section A-A’ can be viewed on the Tyrone mine webpage. Most of the Mesozoic section was either never deposited on or was eroded from the Cobre Mountains because this area was a highland on the flank of a northwest-trending Jurassic rift basin known as the Bisbee Basin (Figure 6). Upper Cretaceous rocks lapped onto and buried the rift shoulder. Upper Cretaceous Beartooth Quartzite, which is correlative to the Dakota Formation, unconformably overlies Pennsylvanian Syrena Formation or Permian Abo Formation in this area. The Beartooth Quartzite is gradationally overlain by the Colorado Formation, which consists of a shale member and a sandstone member. The Upper Cretaceous rocks preserve a history of the oscillating landward and seaward migration of the shoreline of the Western Interior Seaway across this area about 90 to 105 million years ago. Figure 7 – A schematic N-S cross-section of the Laramide intrusions and stratovolcanoes in the Chino Mine area (modified from Audetat and Pettke, 2006). 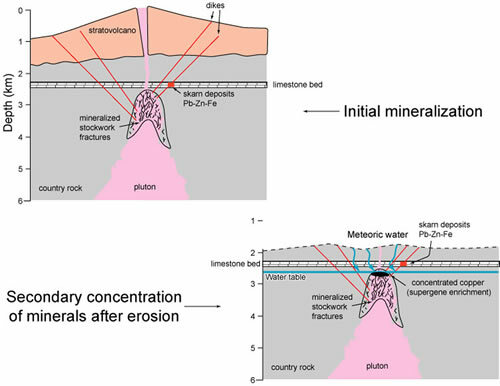 The Cretaceous and older sedimentary rocks were subsequently invaded by several generations of intrusions, some of which were barren and some of which were enriched in ore-generating fluids (Figure 7). Plutonism in the Silver City region began 75 to 70 million years ago and most of the porphyry copper-bearing plutons were emplaced 51 to 63 million years ago, coincident with compressive Laramide deformation in this region. Many of the NW-trending normal faults associated with Jurassic rifting where reactivated as reverse faults during Laramide deformation. Northeast- to east-striking normal faults developed in the Cobre Mountains during Laramide deformation prior to the emplacement of the 58 million year old Santa Rita stock (Jones et al., 1967). What triggered all the volcanic activity in southwestern New Mexico? The activity can be explained in terms of plate tectonics. According to one hypothesis, the story of the porphyry copper deposits and Mogollon-Datil volcanic field actually began nearly 100 million years ago and hundreds of miles to the west, when the Farallon Plate was subducted eastward under the western edge of the North American Plate (Atwater, 1970; Lipman et al., 1972; Elston, 1976). This plate, which was between the Pacific and the North American plates, has largely been consumed by subduction during the last 100 million years; we now see only two small fragments of it on the ocean floor off the west coast today. Originally, the Farallon Plate was subducted beneath North America at a fairly steep angle, giving rise to the magmatism preserved in the roots of the Sierra Nevada in California and the coastal range batholiths of California and Baja California. Magmatism migrated eastward and arrived in southwestern New Mexico approximately 70 million years ago. This eastward migration is thought to have been caused by flattening of the subduction angle of the Farallon plate, initiated either by an increase in the rate of subduction or by subduction of a buoyant oceanic plateau. A similar situation can be observed today off the west coast of South America (e.g., Allmendinger et al., 1997). Between about 70 and 45 million years ago, the amount of magmatism dramatically decreased because the slab was subducting at such a shallow angle that little melting could occur. However, some magmatism did occur in southwestern New Mexico during this time, as indicated by all the activity in the Silver City region. McMillan (2004) postulates that the lithosphere under the Jurassic to early Cretaceous Bisbee Basin rift was still warm 70 to 45 million years ago and facilitated Laramide plutonism in this region. Compression of the crust associated with low-angle subduction led to the formation of northwest-trending mountain ranges in southwestern New Mexico. Between 45 and 36 million years ago, the subduction of the Farallon Plate slowed and the angle of subduction started to increase. New Mexico was still under mild compression as early andesites in the Mogollon-Datil volcanic field began to erupt (Cather, 1990; McIntosh et al., 1991; Chapin et al., 2004). As the slab continued to roll back or sink down into the mantle, hot asthenosphere came in contact with lithospheric mantle that had been enriched by fluids during the subduction process. In addition, the crust began to extend. As a consequence, the conditions were right for voluminous caldera-forming eruptions in Mogollon-Datil field 36 to 24 million years ago. The 35.2 million-year-old Sugarlump Formation, the 34.9 million-year-old Kneeling Nun Tuff, and other eruptive units covered the Cobre Mountains (McIntosh et al., 1991; Chapin et al., 2004). Extension along the northwest-striking Mimbres fault and Silver City fault that define the Cobre Mountains occurred during Miocene time, forming the mountain range we see today. Porphyry copper deposits are low-grade (<0.8%) disseminated deposits of copper found in and around small intrusive bodies composed of porhyritic diorite, granodiorite, monzonite or quartz monzonite (McLemore, 2008). The small plutons (also called stocks) are often shallowly emplaced at depth within 1 to 6 km of the earth's surface. The copper occurs within breccia or in networks of fractures, both in the porphyritic intrusion and in the adjoining country rocks (Figure 8). Steam and gas concentrated during the final phases of the cooling of a magma body becomes pressurized, fracturing the solidified portions of the pluton and the surrounding country rock. The mineralized fluids fill fractures, cool, and precipitate minerals such as copper. Other economic minerals deposited by this process include gold, silver, molybdenum, and uranium. The mineral pyrite, while not economic, is pervasively deposited as well. If the mineralized fluids encounter a limestone or dolomite, the interaction with carbonates forms a special type of deposit called a skarn. Because there is a gradation in temperature from hot to less hot away from the pluton and mineral formation is often sensitive to temperature, the type of mineral deposited is commonly concentrically zoned around an intrusion. In the case of the Chino mine, the concentric mineralization pattern that usually develops around porhyry copper deposits was wiped out by a younger mineralization event. Figure 8 – Schematic, simplified diagram of initial porphyry copper mineralization and subsequent supergene concentration of copper minerals (incorporating images from Zientek and Orris, 2005, and Burnham, 1979). The initial copper mineralization of the Santa Rita stock was low grade and not economic, but the copper was concentrated later during weathering of the stock near the earth's surface (Figure 8). Oxygenated water seeped from the surface into the mineralized country rock and stock that contained abundant pyrite, as well as disseminated minerals of economic interest. The water interacted with the pyrite (FeS2) to form sulfuric acid. The acid leached copper-bearing minerals from the rocks, causing the copper to go into solution. When this acidic, oxidized, copper-enriched solution hit the water table, the chemistry of the solution changed so that it was no longer acidic or oxygenated. The copper came out of solution, replacing chalcopyrite and pyrite deposited in the rock during the initial mineralization with the copper mineral, chalcocite (Cu2S), thus forming a zone of enriched copper mineralization. This natural process is called supergene enrichment (Figure 8). Allmendinger, R. W., Jordan, T. E., Kay, S. M., and Isacks, B. L., 1997, The evolution of the Altiplano–Puna Plateau of the central Andes: Annual Reviews of Earth and Planetary Sciences, v. 25, pp. 139–174. Amato, J. M., Boullion, A. O., Serna, A. M., Sanders, A. E., Farmer, G. L., Gehrels, G. E., and Wooden, J. L., 2008a, The evolution of the Mazatzal province and the timing of the Mazatzal orogeny: Insights from U-Pb geochronology and geochemistry of igneous and metasedimentary rocks in southern New Mexico: Geological Society of America Bulletin, v. 120, p. 328-346, doi: 10.1130/B26200.1. Amato, J., Boullion, A.O., and Sanders, A.E., 2008, Magmatism and metamorphism at 1.46 Ga in the Burro Mountains, southwestern New Mexico: New Mexico Geological Society Guidebook, 59th Fall Field Conference, p. 107-116. Atwater, T., 1970, Implications of plate tectonics for the Cenozoic tectonic evolution of western North America: Geological Society of America Bulletin, v. 81, no. 12, pp. 3513–3536. Burnham, C.W., 1979, Magmas and hydrothermal fluids, in Barnes, H.L., ed., Geochemistry of hydrothermal ore deposits (2d ed. ): New York, John Wiley & Sons, Inc., p. 71–136. Cather, S. M., 1990, Stress and volcanism in the northern Mogollon–Datil volcanic field, New Mexico—effects of the post-Laramide tectonic transition: Geological Society of America Bulletin, v. 102, no. 11, pp. 1447–1458. Elston, W. E., 1976, Tectonic significance of mid-Tertiary volcanism in the Basin and Range province—a critical review with special reference to New Mexico; in Elston, W. E., and Northrop, S. A. (eds. ), Cenozoic volcanism in southwestern New Mexico: New Mexico Geological Society, Special Publication 5, pp. 93–102. Humphreys, E., Hessler, E., Dueker, K., Farmer, C., Erslev, E., and Atwater, T., 2003, How Laramide-age hydration of North American lithosphere by the Farallon slab controlled subsequent activity in the western United States: International Geology Review, v. 45, p. 575–595. Jones, W.R., Hernon, R.M., and Moore, S.L., 1967, General geology of Santa Rita quadrangle, Grant County, New mexico: U.s. Geological survey Professional Paper 555, 144 pp. Kues, B.S., and Giles, K.A., 2004, The late Paleozoic Ancestral Rocky Mountains System in New Mexico, in Mack, G.H. and Giles, K.A., editors, The Geology of New Mexico: A Geologic History: New Mexico Geological Society Special Publication 11, p. 95-136. Lawton, T.F., 2000, Inversion of Late Jurassic-Early Cretaceous extensional faults of the Bisbee Basin, southeastern Arizona and southwestern New Mexico: New Mexico Geological Society Guidebook, 51st Fall Field Conference, p. 95-102. Lipman, P. W., Protska, J. J., and Christiansen, R. L., 1972, Cenozoic volcanism and plate tectonic evolution of the western United States, I, Early and middle Cenozoic: Royal Society of London, Philosophical Transactions, Series A, v. 271, no. 1213, pp. 217–248. Mack, G.H., 1997, The geology of southern New Mexico: A beginner's guide: University of New Mexico Press, Albuquerque, New Mexico: 176 pp. Mack, G.H., Kues, B.S., Giles, K.A., and McLemore, V.T., 2008, Geology of the southern Gila Wilderness – Second day road log, Silver City to Lake Roberts via San Lorenzo: New Mexico Geological Society Guidebook, 59 th Fall Field Conference, p. 27-48. McIntosh, W.C., Kedzie, L.L., and Sutter, J.F., 1991, Paleomagnetism and 40Ar39Ar ages of ignimbrites, Mogollon-Datil volcanic field, southwestern New Mexico: New Mexico Bureau of Geology and Mineral Resources Bulletin 135, 79 pp. McLemore, V.T., 2008, Chino Mine, Santa Rita district, Grant County, New Mexico: New Mexico Geological Society Guidebook, 59 th Fall Field Conference, p. 41-43. Titley S. R. and Anthony E. Y., 1989, Laramide mineral deposits in Arizona. in Jenney J. P. and Reynolds S. J. (Eds. ), Geologic Evolution of Arizona: Arizona Geological Society Digest, v. 17, p.485–514. Zientek, M.L. and Orris, G.J., 2005, Geology and Nonfuel Mineral Deposits of the United States, U.S. Geological Survey Open-File Report 2005-1294A, 179 pp.